Tom Naughton March 26, 2017 March 26, 2017 52 Comments on The Book Report: It’s Done! We finally got everything for the book uploaded to the printer. We were pleased to see that its already showing up on Amazon in pre-order status. Here’s the Amazon USA link. It’s also showing up on Amazon UK and Amazon Europe. 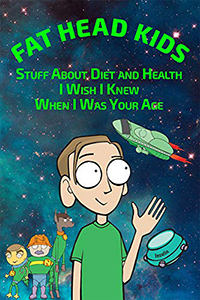 My wife and I are ordering this book for our ten year old son! He is into sports and always wants to know how to eat right for his practices and games! Thank you, Paul. I think he’ll learn a lot. Great work Tom. If kids start out eating healthily (and not the USDA version of healthy! ), they’re more likely to continue it into adulthood, creating a better world for future generations. Yay! I’ve been looking forward this ever since Fat Head Kids’ Club debuted back in 2013. Wishing you amazing success with it. Sara and Alana are fortunate to have such outstanding loving parents in you and Chareva. Now MORE kids can get some Fat Head love!!! I have ordered the book and can’t wait to read it. I appreciate the support from all of you. I, unlike you, am terrible with words, the best that I can say, is our support is well deserved by your (including your family) hard work. And of course, got mine ordered as well. Thank you. I’m ordering copies for both my granddaughters, and a spare to give away. I hope this can get into the Canadian version of Amazon. My son loves all the wonderful artwork in the movie. Interesting … Amazon in Canada has a listing, but it says currently not available. Check again on April 11th. That’s the official on-sale date. As we say in Texas, YEEEEE-HAWWWW! You done good. I’m ordering the book for me. OK, I’m no kid, I’m 75, but long ago learned that books for kids make knowledge accessible. They get the hay down to where the horses can reach it. Lots of work, but definitely a labor of love. Same goes for the film version. I’m working like a madman, but I love it. Looking forward to the movie, too. But do remember to take it easy once in a while, and look after yourself and your family. We can wait a little longer. Your health and sanity are more important!! ? I’ll be in full-throttle mode until the cruise, since I promised to premiere the film. But believe me, I’ll relax for a time after that. The book seems to be rising nicely in the Amazon rankings. With any luck it will shortly outpace the plant-biased titles, not to mention the Disney Princess Cookbook (which appears to be full of junk guaranteed to produce rotund diabetics, perhaps with a side of ASD or even juvenile cancer). Amazon doesn’t so far have a Look-Inside feature for your book. Who makes the call on that? Chareva’s working on that. Apparently the default is to show pages from the Kindle version, so she has to upload look-inside pages separately. We’ll come out with a Kindle version later. Congratulations, Tom! I just did a re-watch of Fat Head and it still holds up. No kids of my own but I do plan on spreading the word on your behalf! We happily accept word-of-mouth from people with no kids. I am looking forward to reading the book – I have been enjoying all of your stuff so far. hope you get to enjoy the spring weather along with all the work. I still get out and do a little farm work here and there to avoid turning to mush. 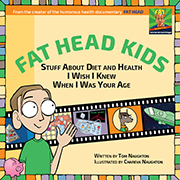 #1 New Release in Children’s Diet & Nutrition Books per amazon.. Probably a very small category, but I’ll take #1 any time. Great News! I’ve been waiting. I’m no kid either, but I’m ordering a copy for myself and one to give away. I figure there are a few adults who might finally get what I’ve been trying to say about diet. They certainly haven’t gotten it with adult books I’ve passed on! In their reviews for the back cover, Mark Sisson and Paul Jaminet both recommended it for kids and adults alike. We wanted to produce something kids can understand, but I suspect quite a few adults would benefit from reading it. I ordered two for the grandkids. One for each family. If Amazon takes orders and delivers in the Philippines, it should be available on April 11. Glad to hear it Sir Tom. Thanks. It appears that outside the US, UK, Canada and Europe, customers have to enter the Amazon site through AmazonGlobal. When doing a search, it eliminates items that can’t be shipped internationally. Thanks for that info Ma’am Chareva. Appreciate it. With a lot of cartoons. Gotta make it easy for MDs to understand. Mine’s ordered, though I’m not a kid. Looking forward to it, greatly. I think adults will enjoy it too. I’ve been paleo for almost 10 years and now and a fat head since the movie was released. I now have twin 6 y/o boys. One eats very much like me and one is a “breadaholic”. Unfortunately their mom, who has never had a health issue in her life or been overweight, is indifferent to diets. My little “breadaholic” is an avid reader though so I’m hoping this book helps alter his thinking about what he eats, especially when I’m not around (I travel for work a lot). Pre-order placed. Thanks for your relentless dedication to exposing the truth about food Tom. I can’t want to read this with them. Thanks, Mike. I hope the book prompts the breadaholic to change his eating habits. Received my pre-order copy last week. Reading it now. I think it will be a little over their 6 year-old brains but I’ll start reading it to them soon and hope some of it sticks. Then I’ll repeat it again later, and keep doing that until they get it. Thanks for doing this Tom. As you said, I wish I had known all this stuff when I was a kid. It would have changed my life. Hopefully it changes theirs for the better, and hopefully they will eventually “spread the word” in school once they understand it. That’ll piss off those public-school teachers and administrators. LOL! Yeah, I suspect it’s a bit much for a six-year-old. We figured adolescents can wrap their heads around it if we make it simple enough. The younger kids might find the film version easier to grasp. I am so excited to see this book! I have been looking high and low for something to show my 6 & 8 year old kids. When I’m trying to explain it to them I’m pretty sure all they hear is blah blah blah, no sugar, blah blah blah. I ordered it today as soon as I heard about it. I appreciate that. I hope they like it.